Have a very quick look at the chart below. 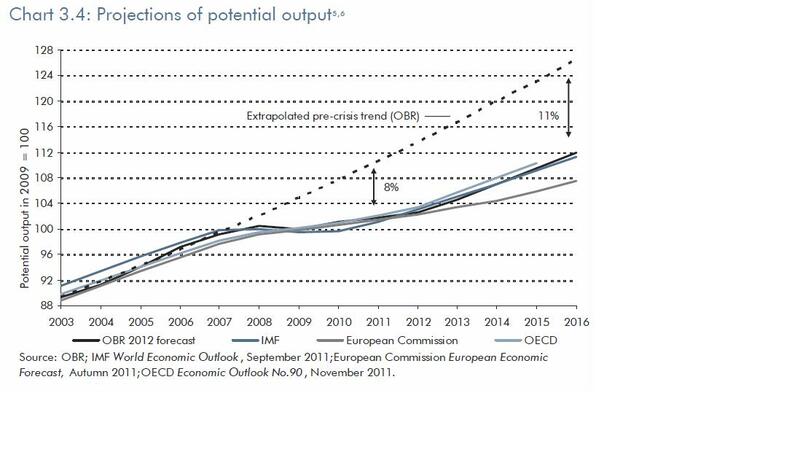 It looks like recent developments in actual output relative to potential. But it is not. It is various assessments of UK potential output against the pre-recession trend. It comes from the post-budget forecast produced by the Office for Budget Responsibility (OBR), the independent body that the UK government has contracted out the job of producing the official budget forecast to. It shows that the OBR, and other international forecasters, think that the recession will in a few years time have led to a permanent loss of UK output of over 10%. That is an extraordinarily large number. It makes the recent US debate on the subject look positively tame by comparison. The OBR estimates mainly come from survey evidence. 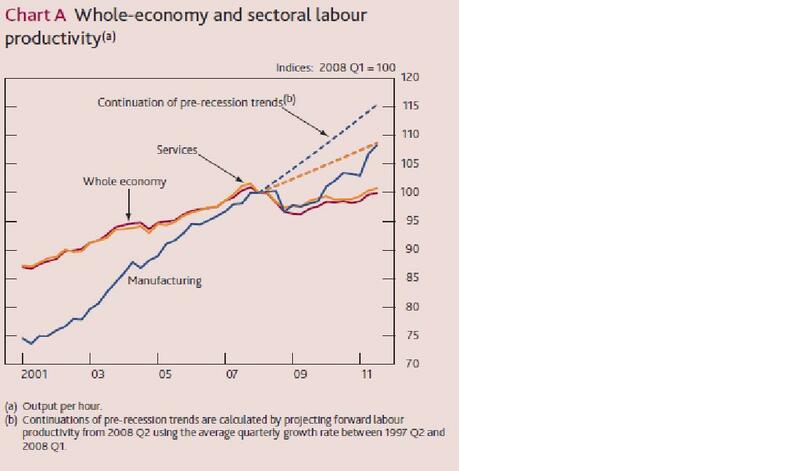 The following chart is from a recent OBR working paper which describes their methodology. We can see the problem by comparing 1981 with 2009. Between 1979 and 1981 UK GDP fell by about 3.5%, whereas between 2007 and 2009 it fell by 5.5%. Yet movements in the output gap look quite similar. More significantly, from 2009 to 2011 UK GDP grew at an average annual rate of just less than 1.5%, yet this survey evidence suggests the output gap was almost halved as a result! The OBR estimate that the current output gap is about 2.5%. Of this about 0.5% represents below trend levels of output per worker, with about 2% reflecting the gap between actual and potential employment. Unemployment is now around 8.5%, compared to about 5% before the recession. Other institutions use a production function approach to estimating productive capacity. The extent to which this is an alternative methodology depends in large part on how underlying total factor productivity (TFP) is estimated. (We can estimate the potential labour force from employment and unemployment, and the capital stock from investment data, but there is no data on changes in how efficiently those factors could be used.) If TFP is imputed from survey evidence on the output gap, we are going to get similar results. So if these numbers are correct, how can they be explained? The major explanation has to come from a slowdown in underlying productivity. Actual labour productivity has indeed fallen in most sectors: the chart below comes from the Bank of England’s Feb 2012 Inflation Report. Now falls in labour productivity are what might be expected in a demand led recession, because it takes time for firms to adjust employment. However after a while one of two things should happen. The first possibility is that employment adjustment does occur as firms reconcile themselves to lower output, so productivity should rebound. It has not, particularly in services. The second is that firms are hoarding labour because they think output will recover to something like pre-recession trends. But in that case they should be reporting substantial spare capacity, which we have seen they are not. 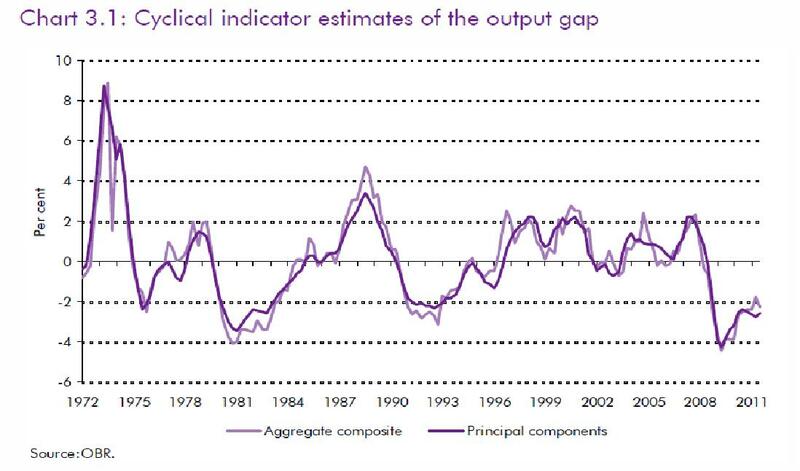 This behaviour in productivity appears to be the main difference between the UK and US estimates of potential output. It is still possible that the survey data is just wrong. This is a view taken by Bill Martin (see both his FT article and the more detailed analysis behind it). However the survey evidence does receive some support from inflation. Although I noted that wage inflation had been very subdued following the recession, and that the recent peak in consumer price inflation was largely caused by commodity prices and tax changes, it remains the case that movements in domestic profit margins appear to be reasonably consistent with the survey evidence on the output gap. Firms are not cutting prices in an effort to utilise substantial spare capacity. However this is fairly weak evidence: there may be other reasons why firms are not cutting prices. If the survey evidence is correct, then we have a major supply side puzzle. Is it the case that innovation has really come to a halt following the recession, perhaps because of financial constraints? Or are there more subtle supply side factors at work? (Subtle is code here for ideas that maybe interesting, or maybe silly.) A further possibility is that hysteresis effects may have operated more quickly than anyone thought, which really would be an indictment of austerity. A crucial question either way, posed by Mark Thoma, is whether these changes are temporary or permanent. In the UK, this is not just an academic puzzle. With inflation still above target, the size of the perceived output gap remains important for (unconventional) monetary policy. Furthermore, and unlike the US, the government’s main fiscal target relates to the cyclically adjusted budget deficit. As I noted here, downward revisions made to potential output by the OBR in November led to a tightening of the government’s austerity plans. This was admittedly put off for a few years, but expectations matter. It is important to get this right, because with hysteresis effects (see DeLong and Summers) there is a danger that pessimism about productive capacity and productivity, even if it is misplaced, may become self-fulfilling. Many factors at work of course but one is that large comapnies drive a high propeortion of productivity improvements and large companies are deferring investment. So new technology and (impoprtantly) new knowhow is not being rolled out as usual - and for longer than in most post-recession periods. A bit of confidence would work wonders. A further possibility which could (at least partially) explain this relates to the financial sector. Before 2008 this earned large profits (contributing to measured output) by taking on tail risks which did not materialise. The financial crisis eliminated this: hence the measured contribution of financial services to GDP, and measures of potential output, will be lower in future. In addition, significant components of the UK financial and services sector have moved offshore for tax reasons, although I'm not sure how this will be reflected in the data. I am puzzled by how little thought economic analysis has put in the linkage between short and long run. Most of the profession is still slave of the short run (demand driven)/ long run (supply driven) dichotomy that dominates macro textbooks. You point to the Noahpinion post - "How Can Debt Affect GDP" - as an example of a "silly" explanation for the supply-side puzzle. Is it silly because it's more of a demand-side explanation , or because you believe debt doesn't matter ? Debt growth increasingly outstripped gdp growth but , not surprisingly , gdp growth ramped up ~2002 as debt did the same. Japan's loss of "potential output" must have been seen as puzzling to economists post-1990 , but taken in the context of the "balance sheet recession" as described by Koo , it all makes perfect sense to me. Why should we not expect the global economy - or that of the U.K. or U.K , depending on your interests - to respond similarly now ? Yep, I agree 100% with this post. Reading some of the comments on the 'silly' article it seems some people get it, but theres still a lot of confusion and intellectual chaff out there. The original poster on the 'silly' article is massivly overcomplicating the issue. Private debt is the start, middle and end of this problem. What possible large source of household debt could lead to an increase in GDP. And when you reach some tipping point might cause a semi-permenant fall in demand. I'll give you a hint, it begins with 'H' and is made of bricks. And the industrial production sectors affected.. oh just all of them. But to a large extent contruction, retail and fininace. Take the Neo-classical blinkers off. Maybe read some Keen. We are all Japan now. A more academic analysis of this key issue from the great man himself. typo in above post - next to last ppg should read: "or that of the U.K. or U.S."
BTW , I'm not suggesting we should implement austerity as a response to the realization that growth in recent years was artificially , and unsustainably , inflated by growing debt. I am suggesting that there exists serious demand deficiencies globally that are structural in nature and that need to be corrected with policy responses , otherwise the need for ever-growing stimulus will continue. In a word , those policy responses should be aimed at increasing the size and incomes of the broad middle-classes globally ( re-establishing the connection between incomes and productivity ), in order to ensure that future "output" has some place to go. "Consumption is the sole end and purpose of all production; and the interest of the producer ought to be attended to, only so far as it may be necessary for promoting that of the consumer. The maxim is so perfectly self-evident, that it would be absurd to attempt to prove it. But in the mercantile system, the interest of the consumer is almost constantly sacrificed to that of the producer; and it seems to consider production, and not consumption, as the ultimate end and object of all industry and commerce...."
Yes, although Wren-Lewis is on the more moderate Krugman-Thoma wing, he is still in the neoclassical camp. Until he absorbs the post-Keynesian critiques of macro he will continue to be unable to correctly analyze the real world we live in. I recommend Godley and Lavoie for him as a good entry point. Godley was I believe a UK Treasury economist. Create a survey data related updates, Data survey and news at SureyTool.com. Survey datas by SurveyTool.com for efficient and effective business growth. Create survey data analysis now!